The term EFT Tapping refers to the Emotional Freedom Techniques (EFT). EFT is a tool that was developed by Gary Craig to help people overcome the unresolved emotions from the past that have a negative impact on our current lives. It utilizes the acupuncture meridians that Chinese medicine has been using for over 2000 years, but instead of using needles in the meridians, we simply “tap” on them with our fingertips. Hence the common term “EFT tapping”. EFT belongs to a category of interventions that are known as energy psychology (EP), and while EP is evidence-supported by over 100 research studies, it is not yet an evidence-based method, so it is still considered experimental. That being said, the Association of Comprehensive Energy Psychology (ACEP) has successfully campaigned to have EFT (and other EP methods) accepted as continuing education for members of the American Psychological Association and other professional organizations. Due to this, EFT is often used by licensed mental health professionals in dealing with severe trauma or other diagnosable mental health conditions and has been proven to be highly effective for PTSD, depression, anxiety disorders, food cravings and addictive behaviour and pain. To see the impressive collection of scientific evidence supporting the use and application of EFT and other energy psychology tools check out this page on the ACEP website. In the twenty years since EFT’s inception, it has evolved and been refined by Gary Craig and his daughter Tina Craig and has become a very effective tool that can be used both as a self-help method and also as an intervention for professional coaches and therapists. For those of us that aren’t suffering from serious disorders of thought or mental health conditions, EFT is an extremely safe and effective tool to quickly and permanently dissipate negative emotional reactions to events from our past. Gold Standard EFT, as taught by Gary and Tina Craig is built on the premise that unresolved emotional issues from our past have a negative impact on our current life as well as our health. When we release old hurts, angers, losses or false beliefs about ourselves and others, the quality of our life and our health, improves substantially. That’s a great question and at this point we don’t have really definitive answers. There is some really interesting neuroscientific theories about how EFT and other EP interventions work, but I’m no neuroscientist so I don’t do it any justice when I try to explain it, but here’s what I can gather with my non-scientist brain. One of the things we know is that EFT lowers cortisol levels. Cortisol is our body’s stress hormone, and in general, lowering it is a good thing. When we’re really stressed our brains go a bit wonky and it can be really hard to think clearly. Now, a big spike in cortisol if you’re being chased by a bear could save your life by telling you to climb a tree or play dead, and that’s pretty good, but if your boss is yelling at you and your cortisol senses him as a threat and tells you to give him a shove or yell back….well, probably not so good. So right out of the gate, we get this nice cortisol-lowering effect that lets parts of our brains that can be rational and think about long-term strategies come on-line to help us re-frame our problems or see them in a new way. If that’s the ONLY thing EFT did I think it would be worth the price of admission, but there is quite a bit more going on than just lowering of cortisol. One of the neat things we see with EFT is that it can calm the amygdala, which is probably why it lowers our stress hormones in the first place. The amygdala (there are actually two of them, and the plural is amygdalae) are known as the fear centers of the brain. EFT seems to be able to send a signal to the amygdala to calm down and not be so jittery. In fMRI studies researchers look at the brain before, during and after various interventions, there are currently two studies underway that should tell us a lot more about what’s actually happening in our brain when we apply EFT. For a great discussion on the neuroscience of EFT between two people that actually know what they’re talking about check out this great video series! There are a variety of ways to learn EFT. If you’re looking to get your feet wet, I suggest beginning with the FREE EFT tutorial at EmoFree.com co-written by Gary and Tina Craig. While the basics of EFT are easy to learn and apply to oneself, getting to the deep roots of our unresolved emotional problems is best undertaken with someone that has developed professional level skills. Those dealing with very severe trauma, serious disorders of thought and mental health diagnoses are most certainly safest working with a licensed mental health professional trained in EFT. 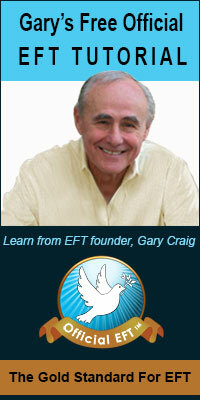 My own EFT training began in 2003 with the training that was being offered by Gary Craig. It has continued to evolve over the years and I had the great fortune of doing my most recent training with Tina Craig, through ACEP. I am currently the only Canadian certified by ACEP as an Advanced EFT Practitioner. For the highest-quality EFT training currently available, I suggest any and all of Tina’s programs.